One of the most highly anticipated professional debuts in Canadian boxing history will finally occur on December 15. 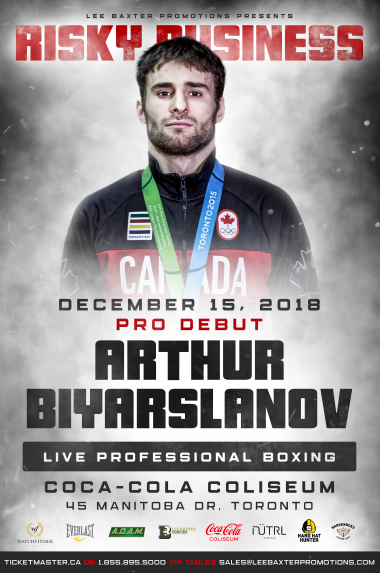 The best Canadian amateur boxer of his generation, Arthur “The Chechen Wolf” Biyarslanov, will finally step into a professional ring for the first time as part of a stacked “Risky Business” card presented by Lee Baxter Promotions at the Coca-Cola Coliseum. As an amateur, Biyarslavnov racked up an 85-13 overall record, and collected four national championships. His greatest amateur achievement was his victory over the great Cuban Yasniel Toledo at the 2015 Pan Am Games, which netted him the gold medal and worldwide acclaim. A year later, he became the only male Canadian boxer to qualify for the 2016 Rio Olympic Games. Now training in Montreal, Biyarslanov will return to Toronto, the site of his Pan Am Games triumph, to begin his career in the paid ranks. “Every promoter in Canada, and probably in the world, has tried to or at least thought about signing Arthur over the past three years, so it’s not lost on us how lucky we are to host his professional debut in front of all of his fans here in Canada,” said Baxter. It’s been a remarkable journey for Biyarslanov. Born near the Chechen region of Russia, Biyarslanov and his family left the war-torn region for Azerbaijan, and later Canada, arriving in the Great White North in 2005. Ultimately, after excelling in a variety of sports, it was boxing that truly helped him find his footing and find himself. As a professional, Biyarslanov has sought the guidance of one of the most respected boxing gurus in the world, Marc Ramsay. Ramsay, based in Montreal, has helped guide the careers of nearly all of the top Canadian pros of this generation, and some of the greatest of all-time, including former light heavyweight champion Jean Pascal, former middleweight titleholder David Lemieux, current light heavyweight champion Eleider Alvarez and more. He is also the trainer of another Chechen champion, Artur Beterbiev, the current IBF light heavyweight champion. The 23-year old southpaw will battle eight-fight Mexican veteran Ernesto Cardona Sanchez in his first pro bout. Lee Baxter Promotions, in association with Athlete Development and Management (A.D.A.M.) will present “Risky Business,” live championship professional boxing at the newly renamed Coca-Cola Colisseum in downtown Toronto, Ontario. The Coca Cola Coliseum is the home of the AHL’s Toronto Marlies, and a spot for some of the city’s biggest concerts and attractions, including WWE wrestling. In the main event, Samuel Vargas will return home to face the undefeated Adrian Gabriel Pereiro, as he begins a new campaign at light welterweight. Vargas is fresh off a thrilling bout with former world champion Amir Khan. Despite coming up short on the scorecards, Vargas not only gained fans, but proved to have plenty of them already. The Colombian-Canadian banger dropped Khan early in the bout, and had him hurt later on in the contest as well. In the end, the fight was the most-watched in the history of U.K. subscription television. Vargas is now honing his craft in training camp in Spain alongside former welterweight champion Kell Brook, as he is determined to return to Canada an improved fighter. In the co-feature of the night, an old fashioned local rivalry comes to a boil, as Patrice Volny battles Ryan Young. Volny scored the biggest win of his career in September, as he dominated veteran Albert Onolunose to capture both the WBA-NABA and WBO-NABO middleweight crowns. The victory situates him in a prime spot within the world rankings in two major sanctioning bodies, remarkably, just twelve fights into his professional career. Another one of Canada’s top middleweights, Steve Rolls, will be in tough against KeAndrae Leatherwood. Both men have enjoyed significant national television exposure, having graduated from the esteemed ShoBox series on Showtime. The card will also feature local favorite Nick Fantauzzi against Marco Parente in a light heavyweight contest, Bollywood star Neeraj Goyat, heavyweight sensation Kristian Prenga, the professional debut of Iranian amateur standout Salar Gholami, and the remarkable return Moncef “Buddy” Askri after an 11-year hiatus from the sport of boxing. Tickets for “Risky Business” are available through Ticketmaster. VIP tables can be purchased by emailing sales@leebaxterpromotions.com. Doors open at 6:00 PM ET, with the first bout starting at 7:00 PM ET.